I have a kind of interesting hobby. 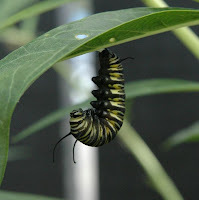 I raise Monarch butterflies from eggs. I was at home with my kids when they were small. I only worked weekends, when my husband was home, and I tried to do the “earth mother” kind of thing sometimes. We spent a lot of time in county parks, we planted gardens, we made a bird sanctuary in our yard. I read them a book once about raising monarch butterflies and we decided to try it. It’s a wonderful thing to do. In late August when the Monarchs migrate to our part of the country, I follow one to a milkweed plant. There the butterfly lays a single egg the size of the head of a pin on only the underside of the leaf of a milkweed plant. Monarchs only lay eggs on the underside of a leaf as the eggs are then protected. Bitter milkweed leaves are the sole food of the monarch caterpiller, so when the eggs hatch, they have a ready supply of food. I bring part of the plant with the newly laid single egg on the underside of the leaf home and put it in a glass terrarium. We watch as the egg hatches later and a very tiny caterpillar is released. It does nothing but climb up and down the plant looking for leaves to eat. It eats slowly and methodically all day every day for it’s entire catarpillar existance. 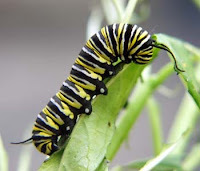 It does nothing but eat and rest and never leaves the milkweed plant it’s entire life. I bring new branches of fresh milkweed leaves home every day. It sheds its skin a few times as it outgrows it. One day, the caterpillar climbs a stick in the terrarium and spins a tiny network of webbing, as a spider does, on the arm of the stick. It puts it’s feet in the web and hangs upside down, assuming the shape of a J. Its skin splits across its back, and its outer body, legs, head and all, falls into a heap on the floor leaving a wet, slimy mess of its insides. But in just minutes, the slimy gooey mess hardens to become a beautiful green crysalis, an elegant green tomb with sparkles of golden glitter on it’s edges. After a week or two, the tomb becomes black, then clear. When the crysalis becomes clear, you can see the monarch butterfly inside. The butterfly finally breaks free of it’s tomb. It will sometimes spend the better part of an hour on my finger as it spreads its new wings for the first time. It seems to contemplate its new reality for awhile before it finally takes off in flight. The Monarch butterfly then leaves me and flies away to congregate with hundreds of thousands of other Monarch butterflies that all meet at the same time every year in Mexico or California. It no longer eats bitter milkweed leaves, but the sweet nectar of flowers. I always wonder how it knows to find it’s way across the country, I have a terrible sense of direction. Do the butterflies recognize or know each other when they arrive for the butterfly reunion? I’ve always loved the Monarchs, but now they are very symbolic to me of the eternity I believe in. I always wonder if the caterpillar in its wildest imagination ever knew of the beautiful and free butterfly it would become. I wonder if it was ever afraid to leave it’s life as a caterpillar, if it ever even imagined the world it would see and the places it would go as a butterfly. I met a woman this year for the first time just hours before she died of signet ring appendix cancer. I wanted to bring her a gift. I brought her a photo of beautiful and free Monarch butterflies. And step into the darkness of the unknown . Violating our assumption of safety…. Yesterday someone asked me questions about my “View From Eighty” blog entry. I initially felt that cancer in one’s eighth decade of life wasn’t all that unfair. At eighty one has already lived beyond his life expectancy, one’s reached an age many of us who are younger and newly diagnosed only dream of reaching now. But in the end, I came to realize that a cancer diagnosis isn’t so much about potentially dying…..it is that, but we all know we will die someday. We accept that. It’s really about what the disease that is cancer does to our hearts, minds and souls. I was in Manhattan just before and just after September 11, 2001. I was actually asked to be in Manhattan on Sept. 11th but was unable to make the arrangements on short notice. I sat on a lawn near the Twin Towers on September 5th. A few months later I visited the memorial, all of the quilts and photos along the wall. In thinking about that recently, I made a connection. I communicate with newly diagnosed cancer patients every day now. I realized why cancer is, as one patient recently said, “hard, hard, hard”. Cancer terrorizes us. And no one, at any age, deserves to be terrorized. I read a statement today about terrorism; that terrorism “is designed to demoralize its targets by violating the basic assumption that one is safe”. After experiencing terrorism in our own country on September 11th 2001, we all questioned our long-held assumption that we were safe. We wondered if a plane in the sky was actually a missle directed as us. No one felt safe using a plane for transportation for awhile, ticket sales plummeted. Every package left in an airport was a potential bomb, a local flu epidemic might be anthrax. We no longer took our safety for granted, we no longer felt well protected, we suddenly felt very vulnerable. We were always looking over our shoulder. Life had changed, life was different. We felt fearful, we felt betrayed, we felt angry, we didn’t trust the future. We felt terrorized. Then I thought, cancer does just that on a more personal level….it terrorizes us. We feel the same when we receive a cancer diagnosis as we did when we watched the Twin Towers collapse. Our world collapses. We are no longer safe, and the threat to our safety is not even something we can control, especially after we’ve exhausted all available medical therapy following the initial attack. We can’t do a lot to protect ourselves from the threat within our own body. Our borders have been breached, the enemy has made it inside. We never know if we have sleeper cells within our own bodies quietly organizing a new attack. Our own biology has turned against us, homegrown terrorism. We are on orange alert most of the time, red alert with every physical exam, CT scan and tumor marker. We can be on red alert for days awaiting CT scan results. It’s hard, hard, hard. We remember the initial attack, so we know how vicious an enemy cancer can be. We’ve seen other victims slowly and gradually lose everything they’ve valued over a lifetime when sleeper cells have regrouped and resumed terrorist activities. We’ve seen the terrorism of cancer in others and watched as they’ve lost their health,their friends and family, their career, their income, their abilities, their dreams, their physical appearance, their freedom and in the end their lives. Some have been tortured. We know what the terrorist is capable of. We are at war with the terrorist and we know we are vulnerable and will be for a long time. We need to also find our mission and our moment as survivors in working to support each other and to support those searching for a cure for cancer. We need to find freedom from the dark threat of violence cancer brings to our lives. We need to finally and forever defeat the terrorist that is cancer. Appendix cancer and other peritoneal cancers are tough cancers to be diagnosed with. I’ve been in the appendix cancer community for a long time now and have communicated with many appendiceal cancer patients (over 300 to date). We see the statistics, and it seems our odds at survival can be very long. We read of 5-year survival statistics in the 30% range for some pathologies when treated with the best medical care available. I read of 10% 5-year survival odds in one study for my own pathology, signet ring adenocarcinoma. Another signet ring statistic I found was a bit more encouraging, it gave me a 15% chance at 5-year survival. We get excited when we read about 50% 5-year survival odds as they seem the best out there. When we are looking for hope, we won’t find a lot of it in the research statistics for appendix cancer. When I initially read stats for signet ring appendix cancer survival I was terrified, there were no good numbers. When I finally found in a research study a 28% 5-year survival for appendiceal cancer patients using one of the more innovative treatments, I felt like I’d struck gold. The 28% survival seemed like such a great number then; prior to that I’d been told my odds of survival were zero. I was filled with hope at reading 28% had lived for 5 years. But we have to learn to take statistics with a grain of salt. They don’t mean much in a personal sense. If we have a cancer that has survival rates of 95% and we are in the 5% that doesn’t survive, it’s 100% fatal to us. Statistics are just numbers. We have to remember, that if only 28% survive, that means 28% DO live a long time, that’s almost one in three. Why CAN’T we be the one in three to survive? It’s kind of an “is the glass half empty or half full” kind of a thing. It’s all how we look at it. I also recently read this, written by a man who was diagnosed with mesothelioma. When he asked his physicians to refer him to reading material about the disease, he was told there was really no good reading material available. He decided to find out for himself what information was available and discovered the mean survival rate for his cancer was 8 months. No, the reading material wasn’t good. But in the end he survived 20 years after his dismal diagnosis. He wrote an essay I am linking to here; it’s very good reading when your mind is stuck on the statistics. For myself, once I selected a surgeon and had a treatment plan in place, I forbid myself from reading anymore studies or statistics about appendix cancer. I decided to give it all to my surgeon and to my God. It gave me a tremendous amount of peace to let go of the numbers. And so far, I appear to be defying the 10-15% statistics. March 29th will be seven years from my diagnosis.